PenLight will pay your business to save money! It’s simple, really. 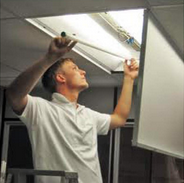 Our Commercial Lighting Rebate Program typically covers 30–70% of the cost of lighting upgrades. Your business will save on electricity costs while enjoying improved lighting quality and comfort in your work environment for years to come. There are many ways to customize your business with energy efficient lighting. Common lighting retrofits include replacing incandescent, T12 fluorescent, metal halide, and high pressure sodium lighting. Today’s new lighting controls and Solid State Lighting (LED) products can provide solutions for better lighting design and, at the same time, save on maintenance costs. PenLight can incorporate other measures such as HVAC or refrigeration upgrades that can increase your rebate amount and overall energy savings. If you are a business owner in PenLight’s service territory, call 253-857-5950 or send an email. Are you a Lighting Contractor? Resources are available to help you with choosing and installing energy efficient lighting. The Northwest Lighting Network provides training, design tools, and current information about lighting technologies. To apply for a rebate, you must complete the BPA Lighting Calculator version 3.3 and submit it to PenLight for pre-approval.